Create your own ISS Designs wall mounted shelving system that is stylish, strong and flexible. The exclusive Infinite Channel Design of the ISS Designs aluminum standards works with the ISS Brackets to provide an attractive wall shelving system with infinite adjustability and strength. 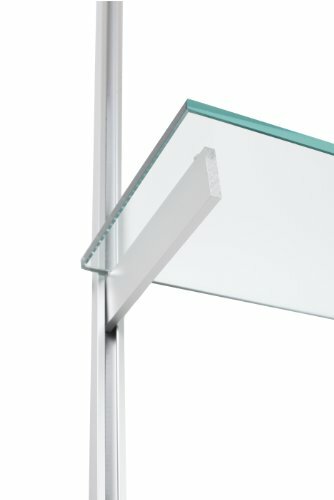 The vertically mounted Simple Standards offer the minimal appearance for surface or recessed mounting using the provided #6 screws into studs or wall anchors. Just mount the vertical standards to the wall, position the ISS brackets at any height on the wall standard and push them down to lock into place. The ISS Brackets are satin anodized aluminum with a specially designed hidden steel pin that secures the bracket into place. It has no visible slots like traditional shelving hardware so it is perfect for your home, office or display. The brackets may be placed at any vertical location and the shelf rests on top of the 1/4-Inch wide bracket surface. Add your own 12-Inch depth wood or glass shelves from 24-Inch to 36-Inch in length to complete your shelving system. Each pair of 12-Inch ISS Brackets can hold up to 130 pounds. If you have any questions about this product by ISS Designs, contact us by completing and submitting the form below. If you are looking for a specif part number, please include it with your message. CLOSETMAID 71924 Shelf Support Bracket, 16"
Stanley Hardware S250-591 773 Ornamental Shelf Brackets in Nickel , 7" x 8"
Stanley Hardware S250-592 773 Ornamental Shelf Brackets in Antique Bronze, 7" x 8"